Our Development Manager, Dr. Angela Schlenkhoff Hus, who is based in London, shares her experience of mentoring a young refugee in a small town in Germany, thanks to a new digital platform. For the past two months I have been logging on to an online platform on Wednesday afternoons from my work computer and being connected with a young refugee based in a small town in Germany. As a German speaker with a professional background in volunteer management, I was recruited as a volunteer to test a new digital platform designed to overcome geographical barriers and make mentoring available to a wider audience. I was excited by the potential that something like this could have – being able to share my skills and experience with a young person in Germany from my work in London – but wondered whether we would be able to establish a meaningful connection remotely. For the past six weeks we have spent an hour each week having a conversation through the webcam, completing exercises and learning more about each other as a result, all in order to help him improve his language skills and find his feet in a culture and society alien to him. Noticing his skills improve over this time has been immensely rewarding, and I have learned so much from him in terms of resilience, perseverance and determination. Being a digital mentor follows a similar journey to face-to-face mentoring: the application and training, the initial nerves before the first meeting, the breaking the ice, the getting to know the other person and understanding them better, the light-hearted conversations and laughter while still working towards a specific goal as well as seeing that wonderful light-bulb moment when something in your mentee’s head suddenly clicks. The only difference is you could be sitting anywhere in the world and have this experience. All of this has been enabled by an online digital platform created by the award-winning German social enterprise Volunteer Vision. Their team have extensive experience in the German corporate social responsibility and employee volunteering world. 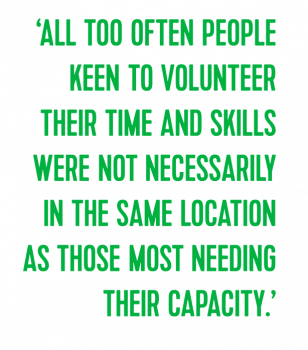 They also recognised that all too often people keen to volunteer their time and skills were not necessarily in the same location as those most needing their capacity. Volunteering online seemed to be the answer, and so they set out to develop software that would connect mentors and mentees across geographic barriers. Even in the very early stages I could see the sophistication of the technology, how every technical and human eventuality had been considered and a solution found – and how impactful this could be for many of our community partners in the UK, especially those in remote areas where they are unable to access support from employee volunteers. With over 25 years’ experience in employee volunteering, we have seen first-hand that many employees have the talent and will to engage in volunteering, but find themselves too time poor to commit for longer periods of time. Volunteer Vision has the potential to change this. While conscious that contact though digital technology will never replace the benefits of face-to-face contact, it enables connections and support that would otherwise be inaccessible. Volunteer Vision opens up the power of mentoring to a whole new audience – in fact, since the founding of the company, Volunteer Vision has registered over 1,500 participants and executed over 2,000 mentoring sessions across 10 countries! Volunteering Matters has teamed up with Volunteer Vision to create eMentor Me, bringing digital volunteering opportunities to businesses and young people across the UK. To find out more visit our Employee Volunteering pages.